Our administrative offices are located 16 miles southeast of Savannah, GA, on the north end of Skidaway Island, situated on the campus of the Skidaway Institute of Oceanography (SkIO); a multidisciplinary research institution within the University System of Georgia. This location enhances our ability to work in partnership with a variety of academic and research institutions. Alter the last step of these driving directions to Skidaway Institute of Oceanography by following McWhorter Drive only 3.9 miles. When you see the open field on your left, the entrance to the Gray's Reef drive will be a gravel driveway on your right. 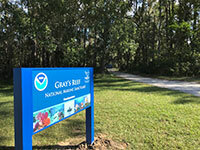 A sign with blue background, NOAA Logo and Gray's Reef National Marine Sanctuary, will be on the left of the entrance to our drive; a 3-4 foot anchor standing upright, with GSU Lab in blue lettering on it, will be standing upright by a tree at the right of the entrance to our drive. The Gray's Reef office is the blue building with white awning and blue text and logos after the wooden gate. Click here for Google Map of the Gray's Reef administrative offices on the SkIO campus.